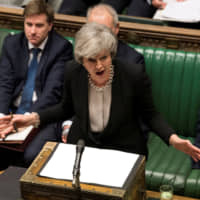 LONDON - U.K. Prime Minister Theresa May was under pressure on Monday to give a date for leaving office as the price to bring Brexit-supporting rebel lawmakers in her party behind her twice-defeated European Union divorce treaty. May called rebel lawmakers including Boris Johnson, Jacob Rees-Mogg and Steve Baker to her Chequers residence on Sunday, Downing Street said, along with ministers David Lidington and Michael Gove. The two ministers denied reports they were being lined up as a possible caretaker prime minister. “The meeting discussed a range of issues, including whether there is sufficient support in the Commons to bring back a meaningful vote (for her deal) this week,” a spokesman said. May told the lawmakers on Sunday that she would quit if they voted for her twice-defeated European Union divorce deal, ITV news said. “I am reliably told that Theresa May told Boris Johnson, Iain Duncan Smith, Steve Baker, Jacob Rees-Mogg, David Davis et al at Chequers that she will quit if they vote for her deal, including the backstop they hate,” ITV political editor Robert Peston wrote. “But she gave no specifics. So there is not a lot of trust she would actually quit,” Peston wrote. May was told by Brexiteers at the meeting that she must set out a timetable to leave office if she wants to get her deal ratified, Buzzfeed reporter Alex Wickham said on Twitter. The Sun’s political editor, Tom Newton Dunn, said some ministers were urging May to pivot to a no-deal Brexit as the only way to survive in power. May’s deal was defeated by 149 votes on March 12 and by 230 votes on Jan. 15. 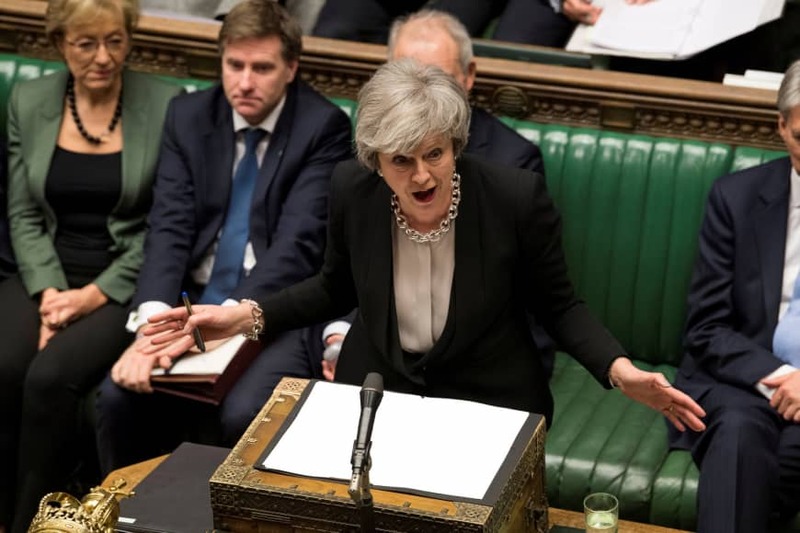 To get it passed, she must win over at least 75 MPs: dozens of rebels in her Conservative Party, some Labour MPs, and the Northern Irish Democratic Unionist Party (DUP), which props up her minority government. Brexit had been due to happen on March 29 before May secured a delay in talks with the EU. Now a departure date of May 22 will apply if Parliament passes May’s deal. If she fails, the U.K. will have until April 12 to offer a new plan or decide to leave without a treaty. Some lawmakers have asked May to name her departure date as the price for supporting her deal. Lawmakers are due on Monday to debate the government’s next steps on Brexit, including the delayed exit date. They have proposed changes, or amendments, including one which seeks to wrest control of the process from the government in order to hold votes on alternative ways forward. Amendments are not legally binding, but do exert political pressure on May to change course.